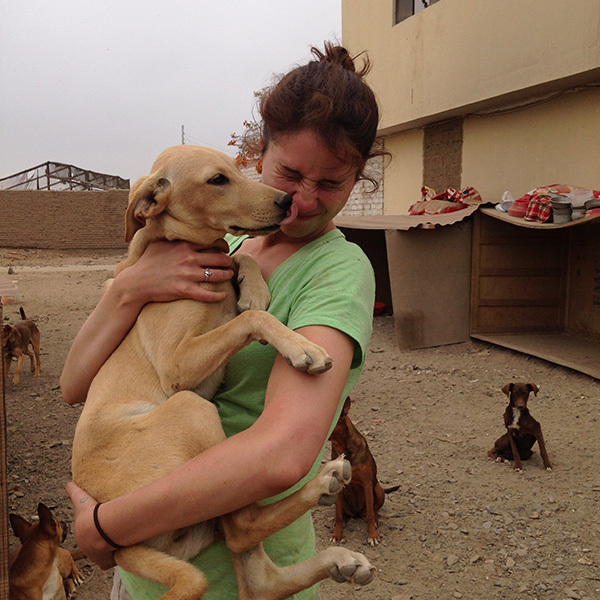 Do you love dogs and have always wanted to be involved in animal welfare projects? We are depending on the help of volunteers and are always looking for help. The work is basically 6 mornings and 2/3 afternoons a week. Every morning at 9.30 we take the bus to the shelter (about 7 mins). We clean, feed, play, walk etc. Around 12.30 we go back to Huanchaco. In the afternoon at 4pm 2 volunteers go back to feed a few dogs who need an extra meal (puppies for example), check the water, and lock in the dogs that need to be locked in for the night. You will come back around 5pm. We can take in up to 6 volunteers at a time. The most important is that you love dogs! And that you feel comfortable around them. You must be 18 years or older. For veterinarians and veterinarian students that are looking to obtain more experience or do an internship we have the possibility to combine working with the dogs in the shelter in the mornings with working at an animal clinic late afternoons/evenings in Trujillo. We ask for a minimal commitment of 3 weeks. Reason for this is that every volunteer needs to be taught, things explained and be guided. any shorter then this is for us not feasible. The longer you stay the better you get to know the dogs and the dogs you. It will only get more and more rewarding! As well as the great experience you will be staying in Huanchaco, a little gem of a fishing and surf village in northern Peru. Enjoy the people, waves and beautiful sunsets. A lot of organizations ask for a fee to get involved in volunteer projects – we don’t! We have our own accommodation with volunteer rooms. The house is beautifully located near the beach. The costs for the accommodation are only 20 soles per night. This includes water, electricity, wifi, shared living room, kitchen and outside patio. We do not ask for any additional fees to be paid! 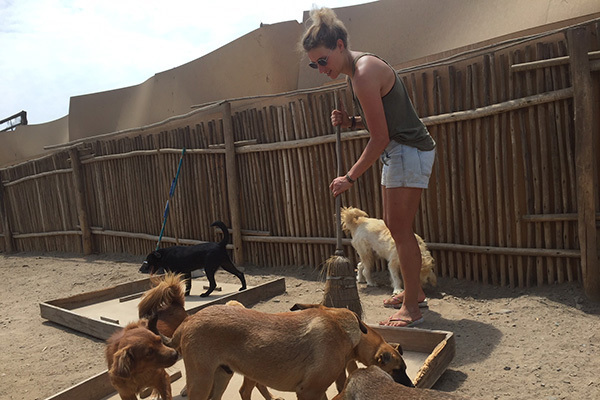 My time spent at the esperanza canina dogshelter in huanchaco, was by far one of my favourite experiences from Peru. Every time I went to the shelter the dogs would run up and jump all over me, I felt like a celebrity! I made some really great memories with the dogs like when we held an adoption event and found homes for four of our puppies within two hours! It was so difficult to say goodbye, yet rewarding to know that I, along with the other volunteers had been able to make a difference in their lives. Working at the Esperanza Canina dog shelter was probably the most enriching experience of my life so far. When I arrived the dogs were living in a huge empty yard, with a few cardboard structures for shelter, and still the dogs were happy. The difference to the shelter eight months later is already astounding. Visiting the dogs every day, feeding them, changing their water and playing with them, was any dog-lovers idea of heaven. The volunteers put their all into making these dogs’ lives better through donations, fundraising and simply giving their time. 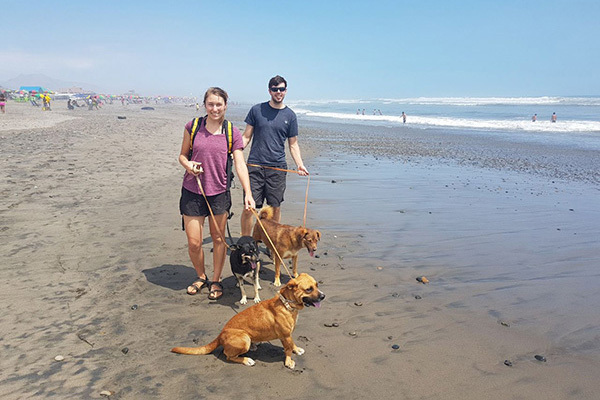 I live happy knowing that the pups I left in Peru are well looked after at Esperanza Canina, and I’m just waiting for the right opportunity so I can go back to visit!